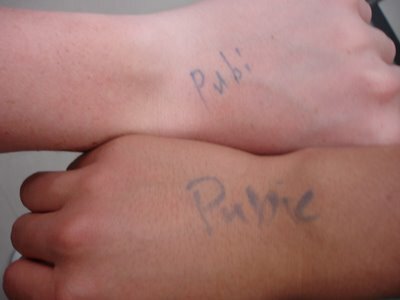 the hand on top is mine, and the one below belongs to a friend in my class. The japanese are incredibly immature, take for example, this picture. We played a modified version of the game horse at break today. We played rock-paper-scissors, and if you lost, the winner got to write one letter of the chosen word on the losers hand. Ken Ishida (but since it is japan, everyone calls him Ishida) chose his favorite word in the entire english language: pubic. THis is the word that I corrected the pronounciation of from teh dictionary, because it pronounced it like the first three letters would suggest pub(a place where you get a drink) and then ic. As you can see, I won the game. one of my other friends wanted to play with his favorite word (im not going to say what it is) but we didnt have time.